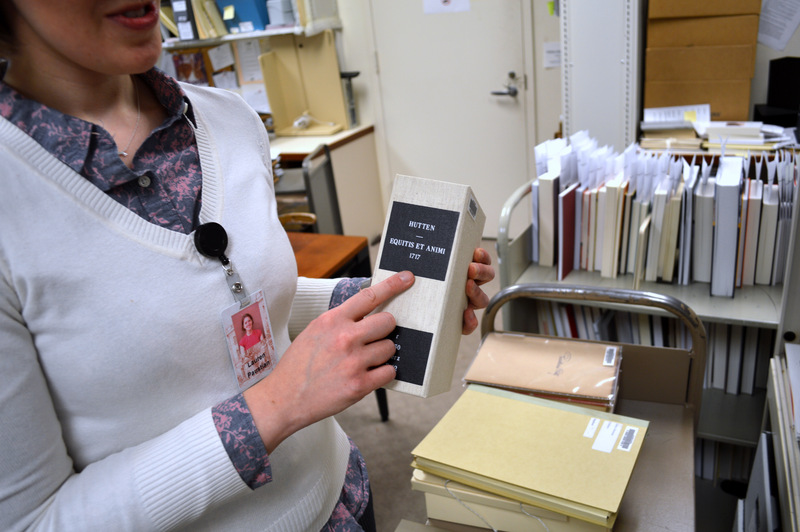 Caring for a library of over 80,000 physical volumes is a hands-on job, according to Lauren Paustian, an associate librarian who handles many of the LBI Library’s preservation efforts. During “National Preservation Week” (April 26 – March 3, 2015), Paustian offered visitors to the Center for Jewish History (CJH) an overview of what it takes to preserve these materials for future generations. 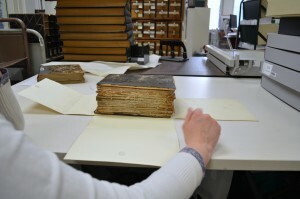 Here you can see a variety of past preservation measures that actually compromised the condition of the books. 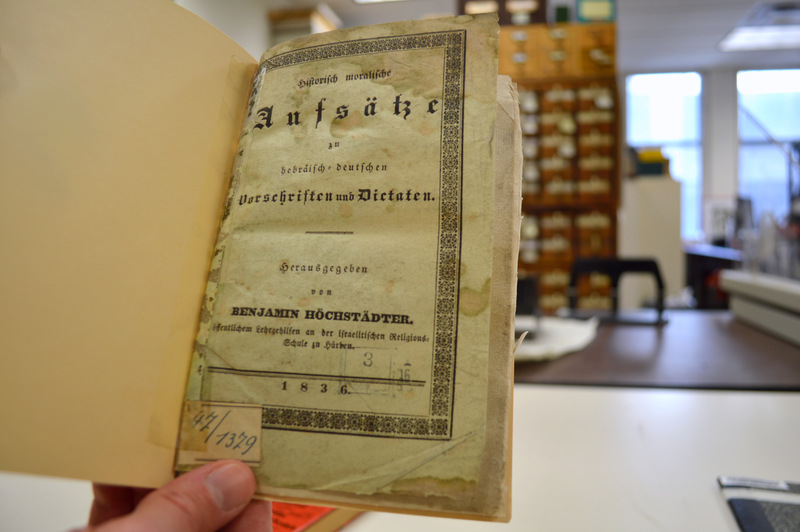 Acidic tape was used in an effort to stabilize these books, but now it is decaying. In some cases the covers were cut off, and in one case, the dust jacket was affixed permanently with acidic tape. 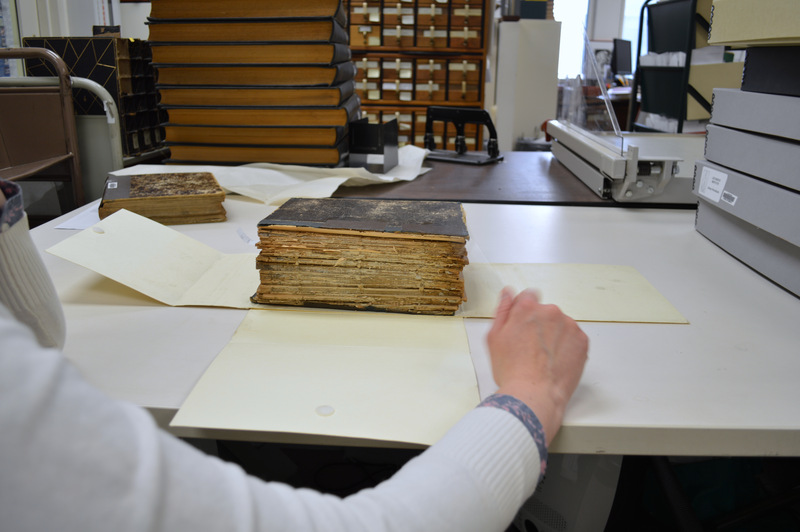 We can’t undo these measures without damaging the books, but if we were to receive a donation of any copies in better condition, we would replace them. The dust jacket of this book was permanently affixed to the book with tape. This book was improperly rebound into a new cover. 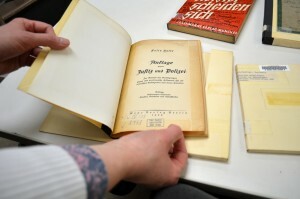 The cover of this book was removed and an attempt was made to stabilize the pages with harmful acidic tape. 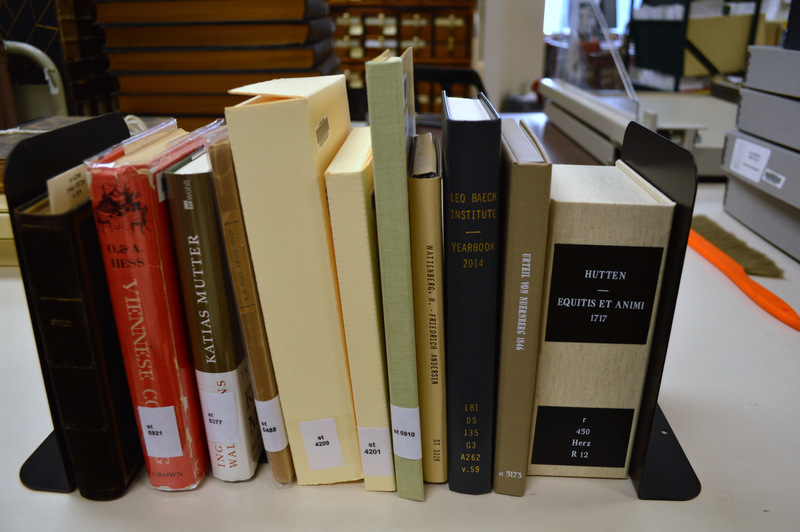 Today, we make every effort not to alter or affix anything to books at all. Nearly every book that’s not a recent hardcover gets its own enclosure, which ranges from a Mylar wrap to protect the dust jacket to custom built boxes with stiff backing to protect the spine and cover of the book. A range of different enclosure types, from mylar wraps for dust jackets to custom clamshells. Also included are tough library bindings, used for reference works that see heavy use. 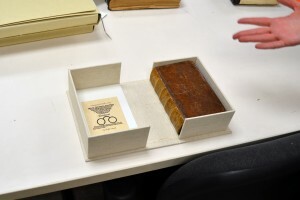 Even when they’ve been digitized and their content has long been in the public domain, rare books see a lot of use, mostly for exhibitions. 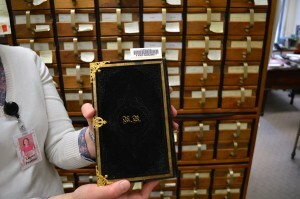 The gold-standard for protecting such fragile and rare books is a custom-made clamshell case like this one. I’ve taken courses on building these, and they are made to such exacting specifications that each one takes several hours of work. We use an external vendor for our clamshell cases, and they start at about $70 for a small book like this one and go up from there. Before the early twentieth century, the printing and bookbinding industries used more durable materials like animal hides and recycled textiles. 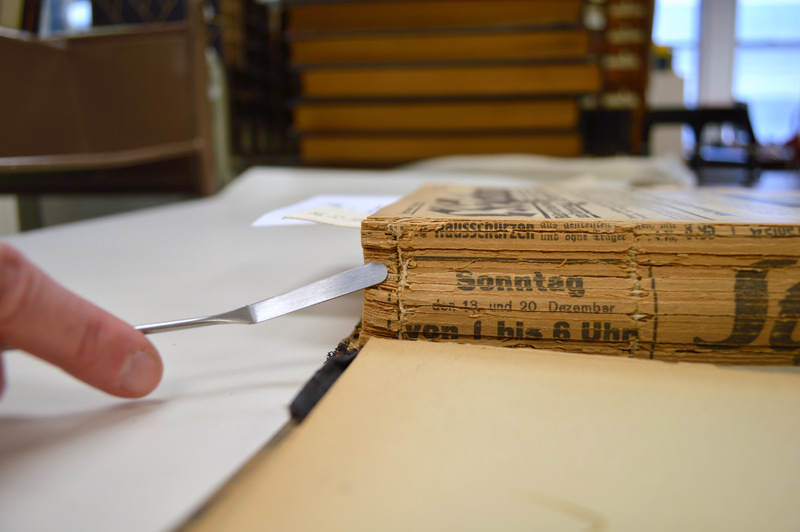 We have a good idea how those materials hold up over time, but no one is really sure what’s going to happen to the wood-pulp paper used for newsprint. Libraries have typically bound these materials in large volumes, but even so they often become too fragile to handle without damaging them. At that point microfilming and digitization is really the best way to preserve them. 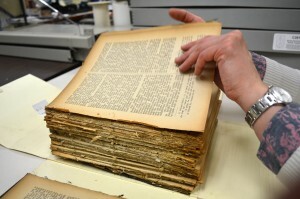 This is an example of newsprint that was bound in a volume too thick to be practical for use. 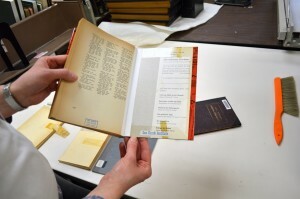 It won’t lay flat for the camera, but microfilming and digitization are the only ways we can provide access without destroying the originals. In cases like this, I get my tools and do some surgery. First I find the threads used to sew the binding. 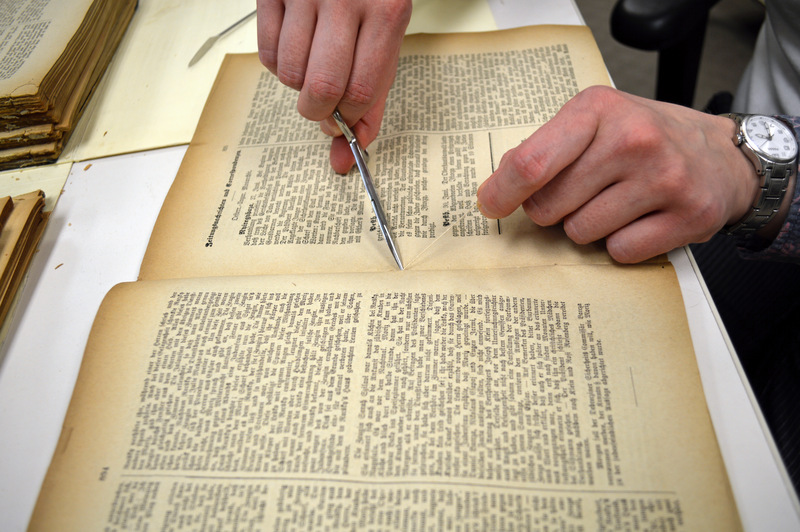 Then I break the book into smaller segments and snip the threads. 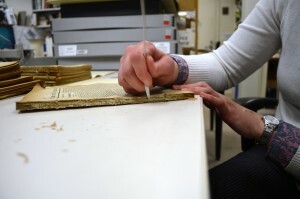 Sometimes I have to also scrape off the glue coating the spine. 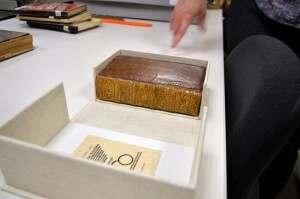 This volume took about two hours to unbind. 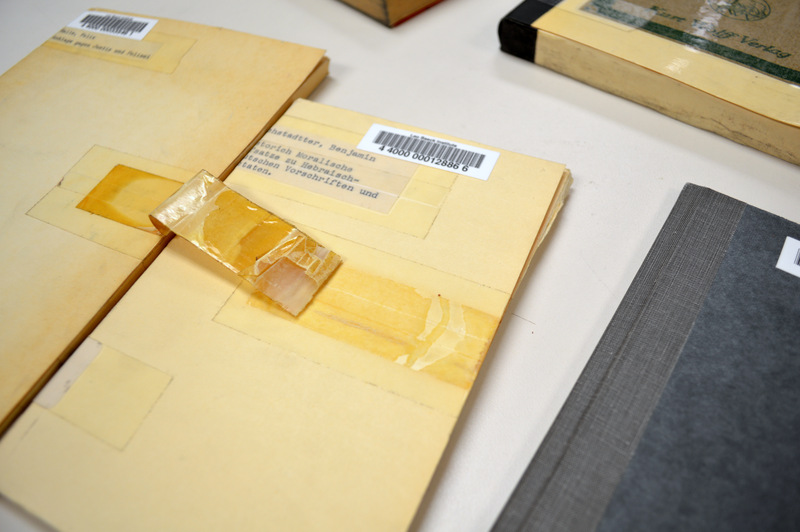 As you can see, it’s a messy job that leaves the originals a bit worse for the wear, but once they are microfilmed and digitized, we can leave them safely in their enclosures while researchers read them online! 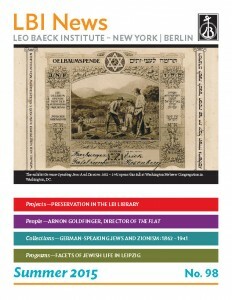 Planning and securing funding for preservation is at least as much work as the actual preservation measures. 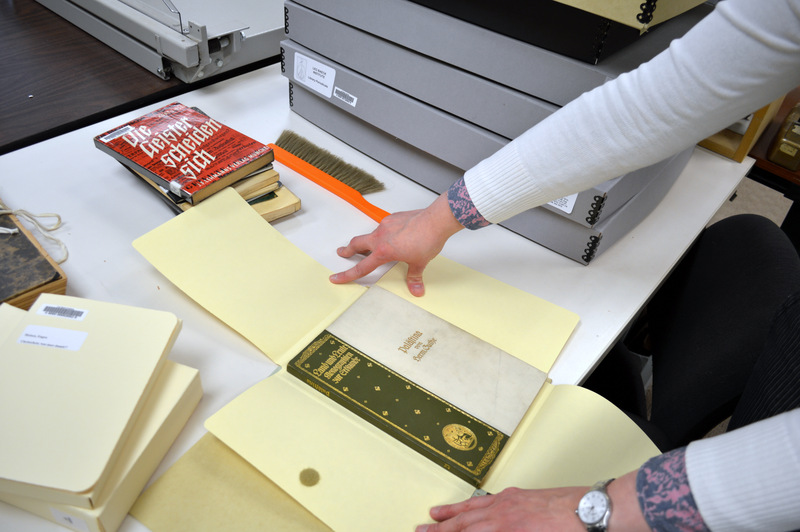 For example, we often apply for NEH grants for preservation, but it’s a two step process. 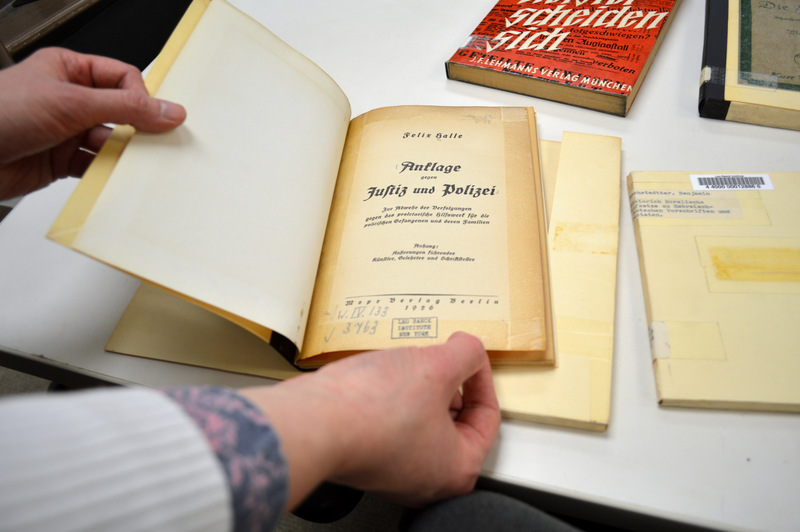 First we apply for funds for a preservation specialist to survey the collections and identify books in need of special protection measures. Then, in a separate process, we apply for the funds to actually measure the books and have the enclosures made. It’s a painstaking effort, and the entire cycle can take three years. 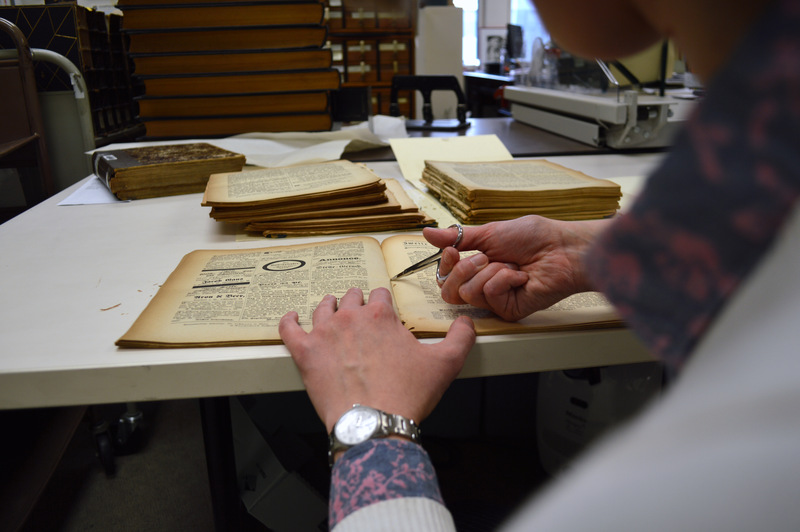 It’s worth doing, though, because if we don’t get it right, the collections are at risk. 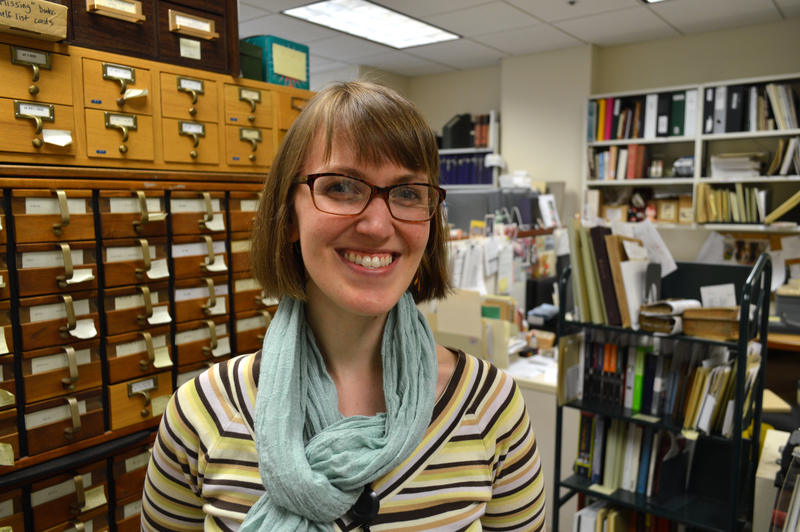 Lauren Paustian is Associate Librarian for Technical Services at Leo Baeck Institute, where she manages preservation measures, processing and cataloguing of acquisitions, and the LBI’s disaster prevention and management plan. 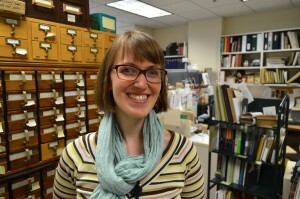 An LBI employee since 2008, she has she has dual Masters’ degrees in Library Science and in Art History from Pratt Institute in New York and a Bachelor of Arts in English from Franklin and Marshall College in Lancaster, Pennsylvania.